Amos Alonzo Stagg was born August 16, 1862 in West Orange. He grew up in the affluent suburbs outside the bustling city of Newark and was educated at Phillips Exeter Academy, an exclusive boarding school in New Hampshire. He was a talented athlete, excelling as a pitcher and batter in baseball. While at Exeter, Amos was part of the country’s storied football rivals, between his school and Andover. The first game was played in 1878, while he was a student. American football was still in its formative stages at this point. Amos took up the game in a big way while a student at Yale University in the 1880s. He was a member of the first All-America team. After graduation, Amos was offered the chance to play professional baseball—a job unsuitable for a man of letters at the time. He turned down the opportunity, yet always the innovator, he designed the first batting cage. Amos decided he wanted to pursue a career in physical education. He enrolled at Springfield Teachers College in Massachusetts, the principal training ground for YMCA administrators. Among his teachers at Springfield was James Naismith. In 1892, Amos participated in the first publicly staged contest of the game that sprang from Naismith’s imagination: basket-ball. Amos scored the only goal for the losing side in a 5–1 game played in front of more than 100 people. Later he was instrumental in developing the sport as a five-on-five game, and was one of the first inductees in the Basketball Hall of Fame. During his time at the YMCA school, Amos coached the football team. He was hired to do the same by the University of Chicago in 1892, and remained at this post until 1932. At Chicago, “Coach Stagg” either originated or popularized the onside kick, quick kick, player in motion, Statue of Liberty play, quarterback bootleg, end-around, the linebacker position and the lateral pass. He also invented the tackling dummy, padded goal post, hip pad and varsity letters. Amos coached Chicago’s Maroons to national championships in 1905 and 1913, and a total of seven Big Ten conference titles. Among his greatest players were Mark Catlin, Fritz Crisler, Paul Des Jardien, Walter Eckersall, Clarence Herschberger, Nelson Norgen, Ken Rouse and Walter Steffen—forgotten now but legendary names in the early days of college football. Crisler and Eckersall became Hall of Fame coaches in their own right. Amos also coached the baseball team at Chicago until 1913. After the 1932 season, the university felt Amos was too old to continue coaching football. He disagreed. Amos moved to the West Coast, where he coached The University of Pacific in Stockton, California until 1946. He won five more conference titles during that time. His final record, including his two years at Springfield, was 314–199–35. From 1947 to 1952, Amos served as an assistant to his son, Amos Jr., the head coach at Susquehanna College in Pennsylvania. During this time he was inducted into the College Football Hall of Fame. Amos moved back to Stockton in 1953 and coached kickers for his old team for a few more years. He was known as the Grandfather of Football. He outlived most of the people who said he was too old to coach. 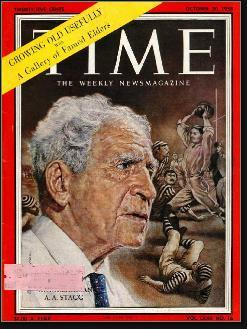 Amos passed away in 1965 at the age of 102.